A Lent lectionary resource using Tom Wright's For Everyone Bible translation, this is the second in a three-volume series to cover the three years of the Revised Common Lectionary. For each day of Lent, there is a reading chosen from the Gospel designated for the year, plus a reflection by Tom Wright. 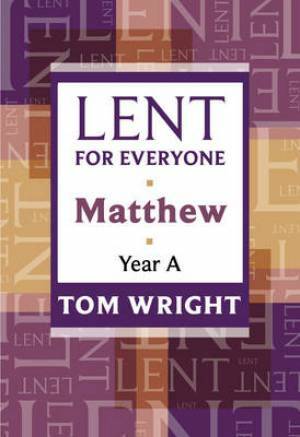 Lent for Everyone by Tom Wright was published by SPCK in January 2011 and is our 3682nd best seller. The ISBN for Lent for Everyone is 9780281062218. This book is the second in a series to cover the Revised Common Lectionary Bible readings for Lent. It includes the readings from Matthew’s Gospel interspersed with readings from Psalms. After each passage there is a 2 or 3 page reflection by Tom Wright. The author has also given us his own lively translation of Matthew’s Gospel. This is a book to help Christians grow in their faith rather than help an unbeliever come to faith. Tom Wright writes in a gentle way drawing the reader into the account. He tries to help us see what it must have been like to hear the words of Jesus and see his actions for the first time. The result is that we see afresh what an amazing life the Lord lived and what an astonishing sacrifice he made for us on the cross. Most of the reflections begin with a helpful illustration taken from modern life and all end with some practical applications for the Christian today. If you do not (like me) celebrate Lent in a special way, do not be put off by the title; this is a book that can be read with profit at any time of the year. Take a peek at some articles related to Lent for Everyone. Got a question? No problem! Just click here to ask us about Lent for Everyone. A:Here is a link to our Returns Page for a thorough explanation of our Returns policy. We can source approximately 60 of Lent for Everyone and so have no problem sourcing 35 copies. Thank you for using the Q&A Forum.